Readers of this magazine will know that our goal in “Sampling the Soul of the Turks & Caicos Islands” is to encourage visitors and residents to look beyond TCI’s sun, sand and sea and dig into the intriguing natural wonders, history and culture that lie beneath the surface. This definition of eco-tourism is shared by local tour operator Big Blue Unlimited, who, a decade before it was fashionable, focused on activities and trips that highlighted sensitivity to the environment and island culture, and involved local people in all aspects of the experience. 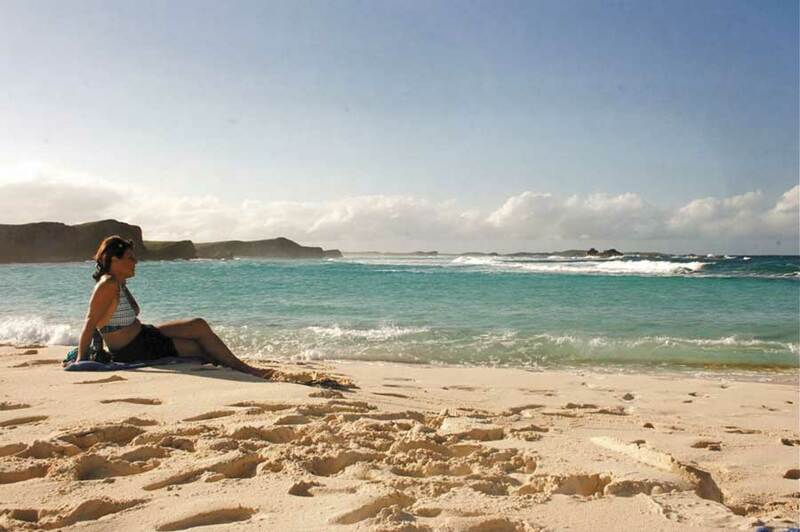 Among the dozen-plus adventures on call, their signature “Heart of the Islands” day-long trip to North and Middle Caicos is a satisfying blend of exploration, education and relaxation that embodies the philosophies of ecotourism like no other. Big Blue maintains a large, friendly staff led by owners Philip Shearer and Mark Parrish and things bustle as dive, snorkel, kayak, paddleboard or boat trips gear up and depart. Our guide was Kew, North Caicos native Demitri Lightbourne, whose big smile, attentive demeanor and wealth of knowledge never faltered over the 9+ hours we spent with him. Our group of eight, a typically small size for Big Blue trips, surprisingly included several Club Med holiday-makers who were eager to sample life outside of the gates. Also along were a couple returning from a volunteer medical aid trip to Haiti. Out the channel over aqua sea we flew in the comfortable 32 foot, dual engine Starfish, rounding the corner of Little Water Cay, now a sanctuary for TCI’s indigenous Rock Iquana. Our first snorkeling stop was just off a natural cut in the reef, and a storm surge lingering from the previous day had foam-capped rollers sweeping towards shore. An intrepid group of four jumped in and I marveled at both the bravery of a first-time snorkeler and the care with which Demitri helped her and the others feel comfortable in the light chop. This area is known for swim-throughs and crevices replete with lobster, grouper, parrotfish and schooling snappers, along with the occasional spotted eagle ray and turtle. With all safely in the boat and accounted for, we cut a path along the brilliant white beaches of Water Cay and Pine Cay, here bordered by smooth, weathered limestone outcroppings. The second snorkeling stop was in shallower water off Fort George Cay (the site of a former British military base to defend the Loyalist plantation families over 200 years ago). Here, the group finned over colorful fan, brain and staghorn corals, carefully following Demitri’s reef etiquette tips to avoid kicking or bumping into the fragile formations. As we drove through Sandy Point (population 30!) we learned that at 44 square miles, North Caicos is the second largest in the island chain. It was immediately apparent that North is much lusher than Provo, with fertile soil and abundant rainfall. (The air even smells verdant and rich here.) We could see the typical backyard gardens, prepared by cutting and burning the “bush” to make space for random plantings of corn, sweet potatoes, beans, cassava, pigeon peas and cabbages, with larger fruit trees such as banana, mango, custard apple, sapodilla, papaya and sugar cane scattered about. Demitri explained that the bulk of the harvest fed the farmers’ family and friends, with some sold locally, but little making its way to Provo. Although iguanas are the largest native land animals in the Islands, they haven’t been eaten since Demitri’s grandparent’s time (“tastes like chicken”), along with the occasional flamingo (I wouldn’t want a leg!). With both species protected, these days residents raise pigs, goats and chickens to round out a home-grown meal. We also heard the distinctive “turkey gobble” of the large Cuban crow, found, appropriately, only in Cuba and the Caicos Islands. As we drove along the smooth pavement of TCI’s longest road, we noted the unlikelihood of rush hour or traffic jams with North Caicos’ population of only 2,000 souls and very few cars. In fact, our next stop, the settlement of Kew (named after England’s Kew Gardens) is home to only 250. Nevertheless, its charming “downtown” held a school, community center, library and post office, along with the police station for North’s four officers. When asked if crime was a problem, Demitri explained that, since “everyone family,” most quarrels blew over quickly and police were on hand simply to keep the peace. 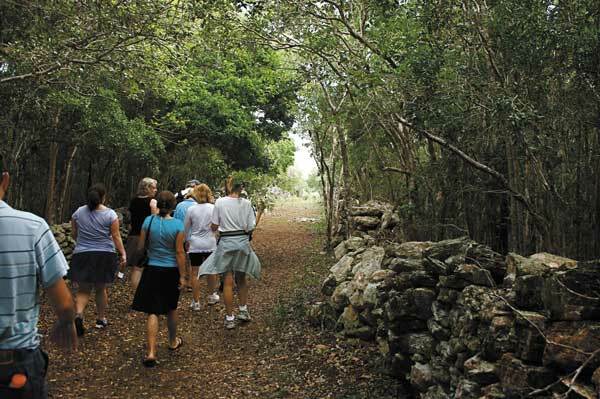 We bumped along a rutted road towards Wade’s Green Plantation, a historic site managed by the TCI National Trust and among the country’s oldest ruins. Wade Stubbs, a British Loyalist exiled from the States, was granted by the Crown 3,000 acres of land in 1789. Besides his family, he brought 350 slaves to clear the land, build the many limestone walls and buildings (many of which still stand), and grow and harvest Sea Island cotton. We entered the grounds through the Field Road, along which grow species of trees said to be started from seeds and pods brought by the slaves from their West African birthplace. Although mosquitoes were vicious following previous days of rain, in between spraying and swatting, we studied, fingered and smelled trees including the locust (whose curved branches were used as ribs for sailing sloops), the West Indian mahogany (whose strong, rosy-brown hardwood made the window sills and door jambs of the plantation buildings), the aptly named “perfume” tree (a form of Eucalyptus whose crushed leaves release a lovely scent), and the logwood tree (whose yellow flower was used as a textile dye). We stayed away from the poisonwood, whose sap can cause a rash, but took careful notice of the gum elemi, said to be a remedy, as well as a favored wood for building model sailboats. Besides cotton, sisal was also grown on the plantation, and 61 year-old Cardinal Arthur described one of his first jobs as a young man: making rope fiber by cutting the saw-toothed sisal leaves, soaking them in the sea for 15 days, then beating the softened pulp on a flat rock— washing, wringing out and drying the fiber to wrap into bales for sailing to market in South Caicos. Adding a rich vibrancy to the tour were Cardinal’s tales of life in “the days”—only a generation or two ago—before the Islands had electricity, running water, telephone, television and imported food. 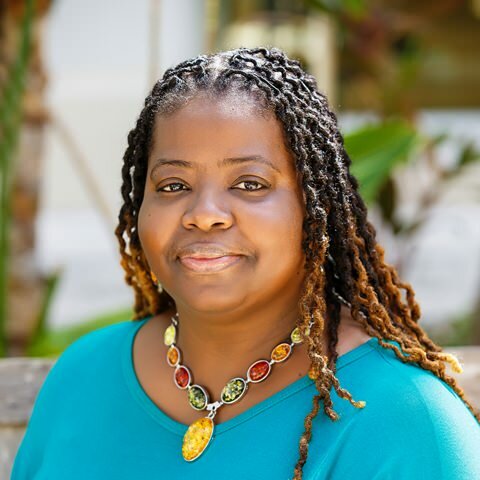 The stories helped us all appreciate the amazing adaptability and ingenuity of these descendants of the slaves left behind when the plantations closed in the early 1800s. Hiking through the tropical dry forest, we visited the ruins of the Great House, where Wade Stubbs and his family were said to live on the second floor, with cotton storage and a slave-holding area below. From his loft, Stubbs had a view to the sea, where boats loaded with cotton set sail. Taking the place of cement in building was a mortar made of burnt crushed conch shells pulverized into lime; a similar concoction was used to white-wash the walls. Fronting the Great House were two iron cauldrons used for washing, cooking and turning sugar cane into molasses. The kitchen was set apart from the main house to avoid danger from the wood-burning fireplace; its hearth and chimney still stand. The slave kitchen was separate again, and interestingly embellished with etchings of ships scratched into the stone. A steep path through the forest brought us to the deep well from which slaves drew water and “toted” it up the hill to the plantation—a difficult task on a cool day, likely tortuous in the heat and humidity of summer. Such freshwater wells abound on North and Middle Caicos and for decades served as a primary source of water. Along the way, we learned the difference between lemon grass (a popular tea) and Guinea grass (fed to animals); Cardinal pointed out common bush medicine plants, including snakeroot (for digestive problems and diabetes) and love vine (think Viagra). 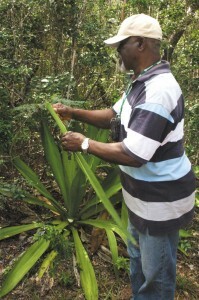 In fact, many Caicos elders are well-acquainted with a full “medicine bag” of natural remedies. Demitri pointed out two buildings that had been misidentified by the original archaeologists who excavated the site. What is labeled as the “overseer’s house” is thought to actually be a chapel, complete with steeple and Holy Water font, while the “slave quarters” is actually a guest house for plantation visitors. More practically, the hundreds of slaves lived in “Nozotown,” about 1/4 mile from Kew. We could have spent hours exploring the vast grounds; as it was, we only scratched the surface. 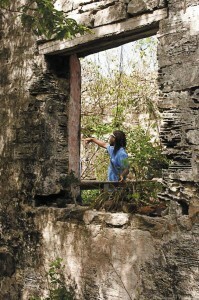 With a full visitor’s guide available, we vowed to return and investigate this important piece of Caicos history. It had been a long and busy morning, and everyone was ready for lunch. Nestled in a fairyland yard bursting with colorful flowering plants, Susan Butterfield’s home was our oasis. Although the Kew matriarch had suffered a fall and was in the hospital, Jasmah filled the gap, serving up a typical native meal of baked chicken or bonefish, peas ‘n’ rice and coleslaw in what was probably the house’s original living room. Our afternoon goal was Middle Caicos, and to get there, we motored through Whitby, a settlement of 300 souls quite popular with expatriates and visitors for its easy access to the lengthy north shore beach. Revived after lunch, we peppered our guides with questions. How do residents earn a living? 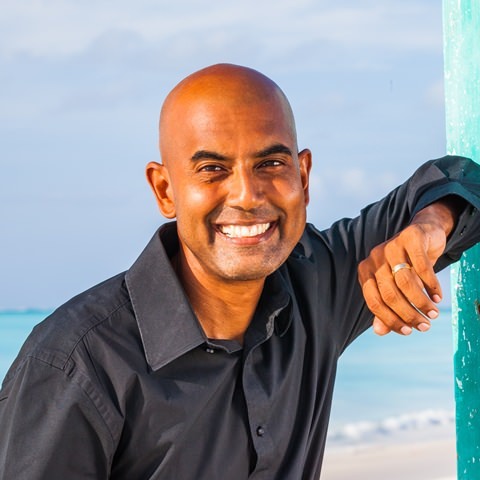 Demitri explained that some work at nearby Parrot Cay, others for government as teachers and administrators, while many are skilled tradesmen —carpenters, electricians, plumbers. The elderly are retired farmers and fishermen, with some passing along their know-how to children and grandchildren. How do they purchase furniture for their homes? Surprisingly, there are stores on North with a limited stock, if you don’t like the style available, you’d have to shop in Provo and ship your purchase over by barge. How much is gas? Topping $6.00/gallon and climbing. It costs even more than in Provo because of the expense to get it to North. Why is the airport runway so long? Plans were to have jets land directly in North Caicos (hasn’t happened yet). We also drove through the largest settlement of Bottle Creek, population 1,200. Homes here line a ridge overlooking the shallow, pale-blue waters of the creek, a popular fishing ground, with views across to the beaches of East Bay Cay. As we neared the causeway connecting North and Middle Caicos, tears filled my eyes as I sighted the remains of the once-magnificent “Pineyard.” For generations, hundreds of acres of the indigenous Caicos Pine created a stately forest across the southwest corner of the island. Several years ago, a scale disease thought to have come from imported Christmas trees in Provo sickened and killed most of these “true pine” trees—ironically, the national tree. While the National Trust is working with Kew Botanical Gardens to save the remaining trees, I fear the forest is lost forever. Just before the causeway, we happened upon Curalena Phillips’ palm-thatched crafts hut. Curalena comes from a family of craftswomen, and we admired the purses, bowls and mats she hand-crafts from plaited palms and grasses. She was busy stitching her trademark “Kat-Do” two-sided doll, so named after her sisters Kathleen and Dora. We were treated to a preview of her new Readymoney Gardens attraction, a labor of love in the making since 1985. The sprawling site reflects the work of a vividly imaginative mind, encompassing a mix of natural and planted sections, water features and cultural attractions with trails that lead guests into different sections that relate to her family’s history and experiences. We also learned how charcoal for cooking is made, starting with wood slow-burned in a pyre-like clump. The causeway connecting North and Middle has a short and tragic history. 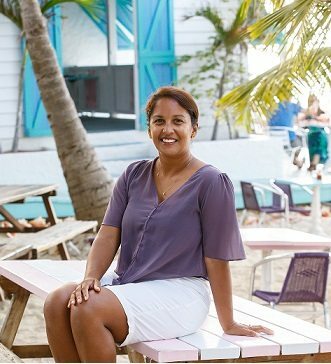 Years in the promising, it finally became reality during the “golden era of development” in 2007, saving time and money for Middle Caicos residents, who enjoyed easy access to North and Provo beyond. Sadly, the hurricanes of 2008 swamped the causeway, washing away the asphalt pavement and fancy streetlights. Today, while passable, its crumbling disrepair seems to reflect the difference between intention and reality during the last PNP administration. Old graffiti in Conch Bar CavesAlthough the largest island in the chain, Middle Caicos is home to only 300 folk, many of them elderly. (Demitri commented that you can probably sleep in the road and not be bothered!) Our first stop was the Conch Bar Caves, another site managed by the National Trust and the largest above-water cave formation in the Caribbean. The cave is Cardinal’s pride and joy, his playground since he was five years old. With flashlights in hand, we gingerly followed Cardinal past the large entrance and into its gloomy depths. 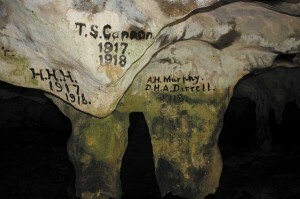 As we carefully picked our way around stalagmites and stalactites, we saw graffiti that was over 100 years old, likely from the entrepreneurs who mined bat guano here for fertilizer in the late 1880s. Cardinal explained that the first people to visit the caves were the Taino Indians, who used the cave for religious rites and as a safe haven from hurricanes. Archaeologists have uncovered artifacts including bones of large tortoises, extinct birds, huge iguanas and pottery. How were the caves formed? These are known as flank-margin caves and formed when sea level was higher, sometime between 100,000 and 125,000 years ago. (In fact, Cardinal noted that in some areas of the island, ancient fossilized seashells have been found in the soil when digging cisterns.) In the boundary of the saltwater and freshwater layers, known as a halocline, conditions exist that cause increased rock dissolution. Both the top and bottom of the freshwater layer are zones that are most favorable for cave formation. As sea-level dropped again, majestic caverns were exposed to air. Water percolating through the limestone, rich in dissolved calcium carbonate, deposited calcite on the ceilings, floors and walls of the cave forming all manner of speleothems. The most notable of these are stalactites (on the roof) and stalagmites (on the floor) and there are a number of impressive examples seen in the Middle Caicos caves. The caves are known to lead to the ocean, as the pooled water within rises and falls with the tides. Indeed a team of cave divers from Big Blue have explored and mapped many of the underwater passages. We were a bit chagrined to discover that several species of bats call the caves home—their eerie shrieks filled the cave as Cardinal pointed his light into column-like openings in the ceiling, disturbing their daytime slumber. Beach at Mudjin Harbour, Middle CaicosAlthough the caves were dim and damp, they were not as chilly as I expected. Between the humidity, bug spray and dust, we were all more than eager for a swim at Mudjin Harbour, one of the most spectacular sights in the Turks & Caicos Islands. A quick drive from the cave past the Blue Horizon Resort and we were at the path to the beach. Here, Middle Caicos’ high limestone cliffs stand as a rugged backdrop to the turquoise sea; at Mudjin Harbour, a huge amphitheater has been naturally carved into the cliff wall. Tiny Dragon Cay juts into the sea, forming a natural lagoon for bathers, protection against the white-flecked waves rolling into the beach. After time for beachcombing, swimming and taking in the fresh sea breeze, Demitri laid out an afternoon snack to prepare us for the long ride back to the marina as the afternoon drew to a close. Although we did not have time today, a typical stop on this and other Big Blue tours is the Middle Caicos Co-op in Conch Bar. Here, visitors can choose from an excellent selection of traditional native handicrafts, created by over 60 local artisans. You’ll find attractive and functional baskets, bowls, hats and handbags woven of local fanner grass and silvertop and whitetop palms. The materials are dried, cleaned and prepared over several days. Handicrafts are made either from plaiting the palmtop fronds into shapes and patterns or by sewing baskets with the fronds used as thread over and around the grass. Other crafts include brooms, brushes, conch shell crafts and rag rugs, along with hard-carved model sailboats made from large branches of the gum elemi tree. Our final stop was at North Caicos’ renowned Flamingo Pond, a vast protected wetland frequented by flocks of hundreds of Greater Flamingos. We weren’t disappointed, and their bright pink feathers seemed all the more vivid in the golden late afternoon “magic hour.” Demitri passed out binoculars so we could take a closer look at the fantastical sight, explaining that the brine shrimp they siphoned from the water contributed to their vivid color. Also thriving in the pond’s fertile waters are blue crab, jacks and snooks, along with blue heron and egrets, ducks and other waterfowl. Our boat ride back to Provo was quiet, as we were all pleasantly tired from the long day. An especially vivid sunset—cascading through every shade of orange, maroon and violet—over ocean’s edge seemed a stage-managed ending. Arriving back in Provo and getting into my truck to confront a busy Leeward Highway at rush hour, I already longed for another chance to spend time in TCI’s Out Islands. Reflecting on the trip over the next week, it came to mind that the original, authentic influences—which often involve a triumph over hardship—are those which best reflect the country’s true spirit. Viewed out of the corners of our eyes was much wrack ‘n’ ruin from the early 2000s, when “bigger” was “better,” “more” was supreme and the love of money ruled. Now, the slowed, closed or abandoned shells of this frenzied, decadent era are eyesores. From the outlandish carnival colors of the Nikki Beach Resort (for which an important mangrove shoreline was decimated) to the ugly rubble pile that was to be “luxury” Star Island (destroying the nearby reef and severely damaging the conch farm during dredging) none adds a spark of appeal to the Turks & Caicos Islands. Instead, the country’s true beauty and rich authenticity, found in the small settlements, friendly folk and amazing natural wonders, are what will stand proud and tall long into the future.To learn more about Big Blue Unlimited, visit www.bigblueunlimited.com.